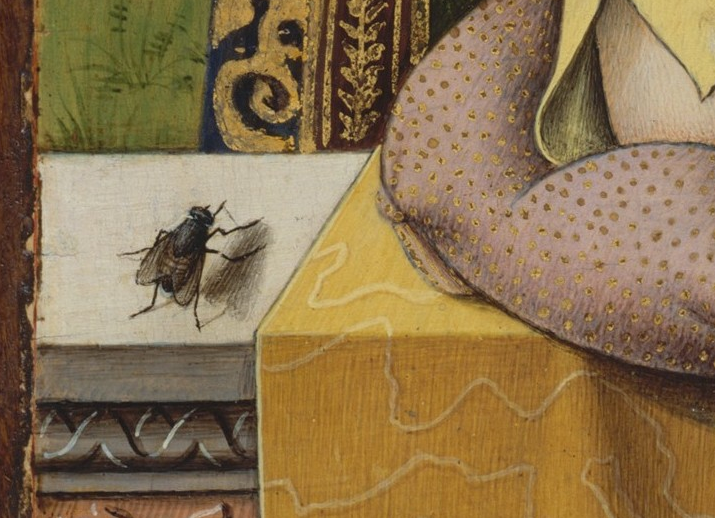 However strange that may sound, the fact is that at the dawn of Renaissance the artists had a strange habit of painting… flies! 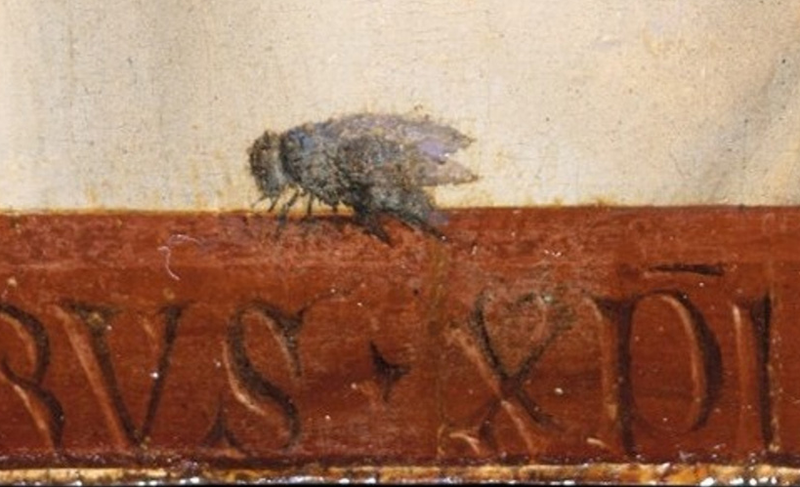 Both in Italy and in the Northern Europe we may find various examples of a trompe-l’œil depictions of a fly. In most cases it is assumed that it was simply the way for the painters to present their professional skills. The Netherlandish artists of the 15th century were famous for their abilities to depict everyday details in a very illusionistic way, which was also related to the development of the new oil painting technique. 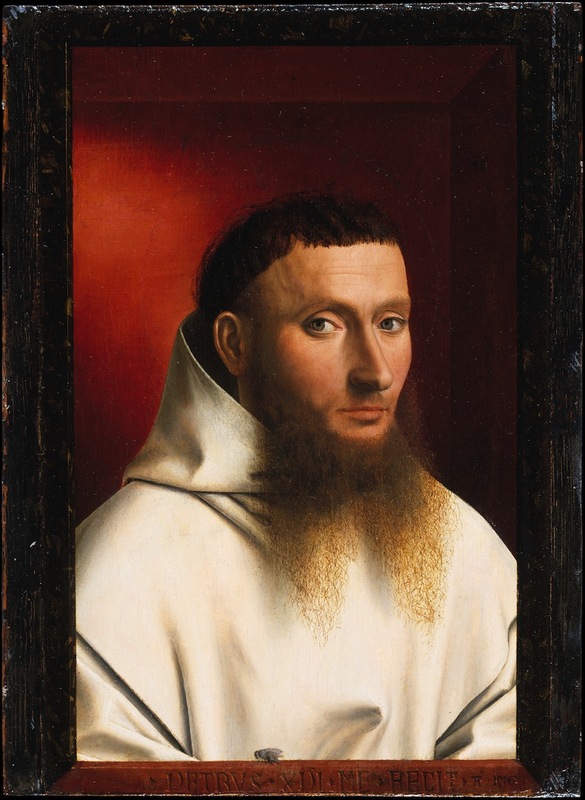 A famous example is “Portrait of a Carthusian” (Petrus Christus, 1446, Metropolitan Museum of Art in New York) – indeed, there is a fly that looks very much like a real one! The 15th century was not only the time of developing the Renaissance in Italy, as the antique traditions were highly valued back then on both sides of the Alps. Those traditions were also mirrored in the fascination of trompe-l’œil techniques, as they were very much appreciated in the Antiquity. There was a very famous story, told by Pliny the Elder, which was about a skill contest between two ancient painters: Zeuxis of Heraclea and Parrhasius of Athens. The contest was supposed to prove which one of them is a better painter in creating the most illusionistic image. Zeuxis painted grapes which appeared so real that birds flew down to peck at them. Then Parrhasius presented his painting, covered by the curtain, but when Zeuxis wanted to to pull that curtain aside, it turned out that the curtain itself was painted. That story was an important lesson for the early-modern painters in Europe: they all wanted to be as skilled as the masters of Antiquity. However, a fly may actually have a symbolic meaning; most often it is assumed that it symbolises evil, as no-one actually likes the flies. They are irritating, they sit on our food, they distribute the dirt and tend to keep flying around waste and garbage. 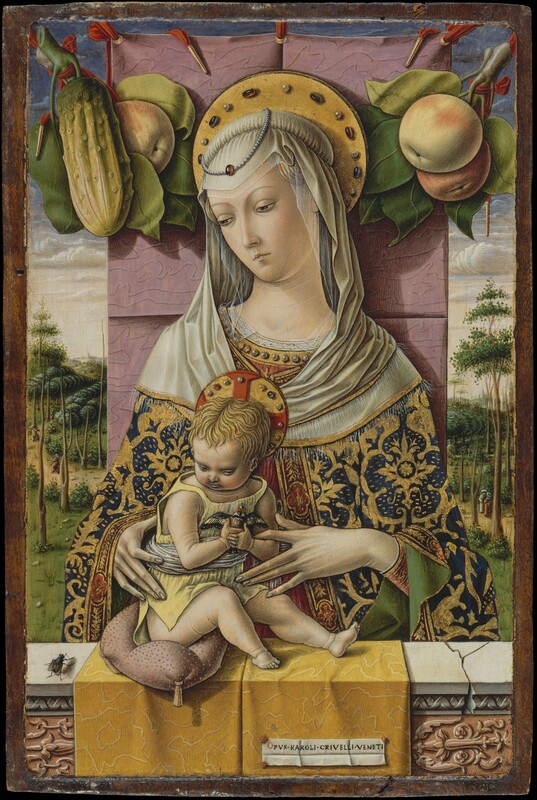 Most likely that negative meaning is a right way to interpret a fly in a painting by Carla Crivelli, depicting Virgin with Child (ca 1480, Metropolitan Museum of Art, New York). 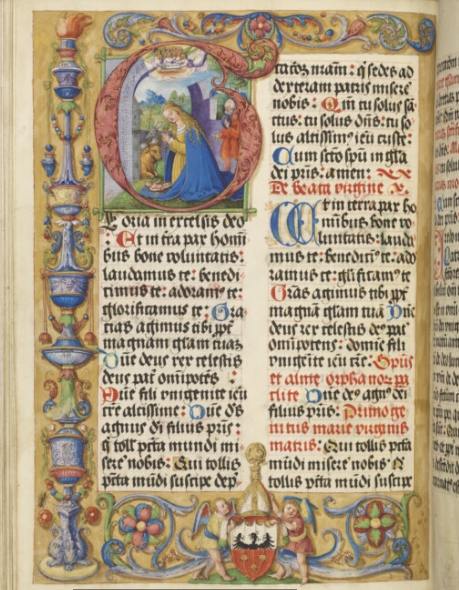 Mary and Jesus are surrounded by dome fruits and vegetables, referring to the original sin, but also perhaps to resurrection. Jesus is holding a bird in his hand: it is a goldfinch, which was symbolizing Christ’s Passion (goldfinch was supposed to live in thorns and a red spot on its head was understood as a reference to the drop of Christ’s blood). So all together this painting collects the symbols of the whole history of Salvation: starting from the sin, through Christ’s Passion to his Resurrection. The fly here would be the symbol of a devil, who will be defeated by Jesus. And finally we must say that the trompe-l’œil insects were often decorating margins of late gothic and renaissance manuscripts. A nice example is a Polish Missal of Bishop Erasmus Ciołek (ca. 1515, National Library of Poland, Rps 3306 III). 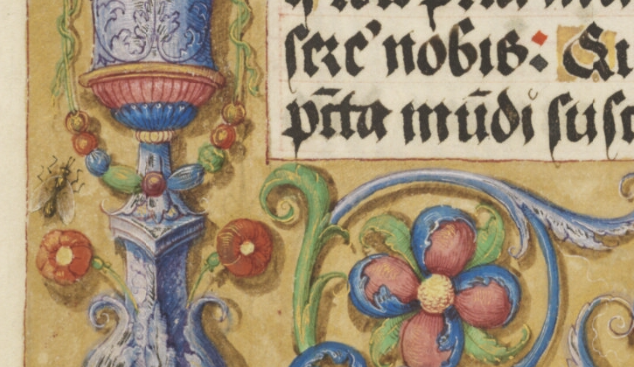 On the folio 102v we may see a rich ornamental marginal decoration, including the angels holding the donor’s coat of arms, and also… a fly! Apparently it was believed that such an illusionistic fly may scare away the real insects and keep them away from the book! Obviously, a fly among beautiful flowers and fruits seems irritating, but still that is the element in those paintings that we tend to focus on. Those images are hundreds of years old, but I suspect that our reception have not changed, at least when it coms to reacting on flies. We have developed a bunch of magnificent inventions since then, but we still get extremely irritated when a fly manages to get into our house. And somehow, they always do!